Every Monday night, on kitchen tables and restaurant menus all around New Orleans, a Creole classic appears red beans and rice. How did this simple dish become so popular, and what makes it different than beans and rice dishes around the world? Let's look into it. Red beans likely first made their way to New Orleans with the white sugar plantation owners who fled Saint-Dominge (Haiti) for Louisiana after the slave uprising in the 1790s. A protein-rich food source that is easy to grow and store, they quickly entered the culinary tradition of the New Orleans Creole community. Monday has a longstanding tradition of being washing day throughout North America. It's unclear why exactly; perhaps getting stains out of your Sunday Best was best accomplished as soon as possible? At any rate, laundry was once quite a labor-intensive activity for the women of the house, who did the washing. Water had to be boiled, clothing had to be scrubbed and wrung and rinsed by hand and later hung to dry. Since this took so much time and effort, it was difficult to also cook a complicated meal for supper on Mondays. Thus, a dish that could sit on the back burner and simmer was ideal. Another tradition in New Orleans, as elsewhere, was a nice big Sunday dinner after church. This dinner would often include ham, and in the old days, ham always had a bone. Putting the hambone to good use as part of Monday's supper, then, was just good common sense, and a favorite use for a hambone is, of course, for making slow-cooked red beans. A hambone, some beans, some aromatics and spices, some water, and a few hours, at the end of which some rice is quickly cooked, and you've got yourself a hearty, low-fuss dinner. And the tradition has stuck around. The New Orleans beans and rice tradition is hardly the only one in the world. 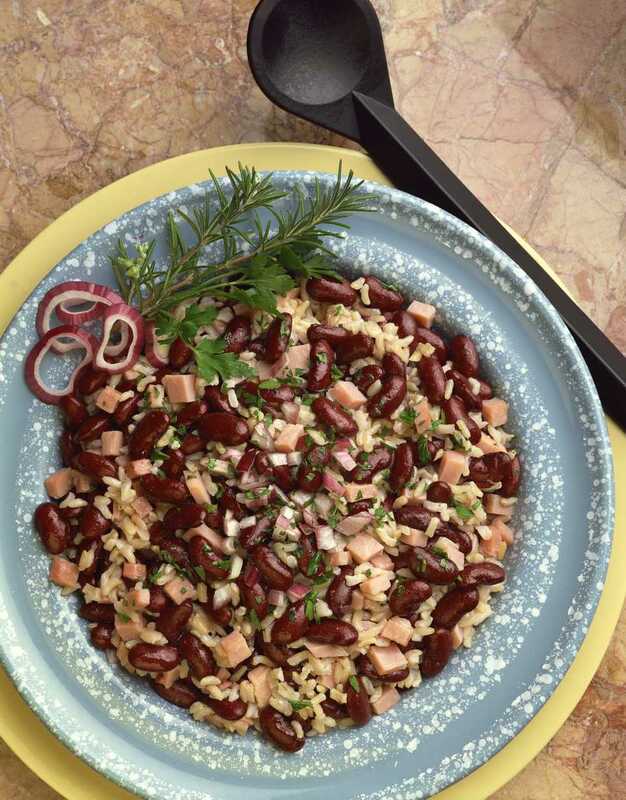 Moros y Cristianos, Hoppin' John, Rajma Chawal, Kuru Fasulye -- really, you can find beans and rice just about everywhere. The New Orleans version is cooked with kidney or small red beans and almost always includes either smoked or pickled pork of some kind or another: a hambone is the most common, but it's also traditional to use ham steak, smoked sausage, pickled pork, ham hocks, or any combination. The beans are cooked for varying lengths of time, depending on the cook's preference, but it's not uncommon for them to be cooked almost all the way down until they're a creamy paste that's barely identifiable as beans. They are seasoned with the Cajun Trinity (celery, bell pepper, and onion) and a bay leaf, as well as salt and Creole spices: red and black pepper, and perhaps some thyme or parsley. The rice is cooked so as to be light and flaky, without the grains sticking together. It's usually served on the side on the same plate, leaving it to the eater to do the mixing. Sometimes beans are served directly over the rice, as well. If you're a visitor to New Orleans, it's unlikely that you'll end up at anyone's home for traditional Monday dinner, but menus all over town offer red beans and rice as a Monday special. It's not universal, but it's overwhelmingly common, especially at neighborhood-type restaurants. Joey K's, on Magazine Street in the Irish Channel, serves a perfectly creamy version of the dish every night of the week. Mandina's in Mid-City offers their well-seasoned beans and rice alongside pork chops, sausage, or a veal cutlet on Monday nights. If you're in the French Quarter, the Acme Oyster House does a thick, flavorful version that's available all the time. Drain and rinse beans well. Melt fat in a pot and add onion, pepper, and celery. Cook until translucent. Add all other ingredients. Cover and simmer for around 4 hours, stirring occasionally. Cooking time and seasoning may be altered for preference: longer cooking will yield creamier beans, more spice may be added to taste, etc. Serve with cooked rice (white is traditional, brown is a good option, too) and pork chops or grilled smoked sausage on the side.